“I want to read about dinosaurs!” says a little voice in the background. Spanish, English and the universal language of laughter blend together in the frigid October air. It’s Family Night at 10 Books A Home, and kids “ooh” and “aah” at experiments demonstrated by one of the organization’s volunteers. Then they get to conduct experiments of their own, dropping food coloring into different fat percentages of milk to observe diffusion and make their own putty. “Look what I made!” says a little boy, showing me his plate of murky colors. 10 Books A Home is an organization that teaches kids age three to five skills like reading, counting and building. But beyond that, the nonprofit aims to help the kids beyond their graduation and to foster their personal interest in learning. Thiebaut’s journey to founding the organization in 2009 started when he read Malcolm X’s biography, the first book he read cover-to-cover. This introduction to literature changed his mindset and the way he viewed education forever. When in college, Thiebaut began tutoring because of the recommendation of a friend. “A girl I worked with [in 2010] had selective mutism,” Thiebaut says. “I had never heard of it before. No one could figure out how to get her to talk.” Yet, in 45 minutes, Thiebaut was able to coax her to speak and write seven sentences. “I found out that no one had ever took the time to ask her her favorite flower. It was a lotus,” Thiebaut says. Thiebaut accidentally discovered his own intrinsic learning motivation: human struggle. However, he soon realized that if he could help kids find their own intrinsic learning motivations, he could give them something that would benefit them for the rest of their lives. When he returned to East Palo Alto from college, Thiebaut was dismayed at the lack of services nonprofits in the area were failing to provide. 93 percent of the Ravenswood School District is low-income, and 81 percent of students are below grade level. Many educational nonprofits aim to raise kids to grade level, but Thiebaut thinks more should be done. At first it was an organization that collected books and put out bookshelves on street corners. However, Thiebaut wanted to do more. In 2011, he piloted a program called “Living Room Literacy” where volunteers read with kids from preschool to grade nine. Thiebaut quickly realized that their age range was too widespread. The organization moved to focus on preschoolers because they discovered that preschoolers could be more engaged and parents of preschoolers were more involved. Currently, the program is structured in such a way where volunteer “role models” read with their “learners” once a week in their homes with parents and siblings for two years, from age three to five. “We want to make sure that the role model is completely focused on their learner,” Thiebaut says. Dovile Norkeviciute is a new volunteer with the program. Not only did Norkeviciute’s learner improve in her scissor skills, but she had so much fun learning and practicing new skills that at the end of the lesson she cried. “You have to go now?” the learner said. 10 Books A Home emphasizes the importance of pursuing education because of personal motivation. Unlike many similar organizations, 10 Books A Home tracks graduates of the program. The program, five years old, has data ranging from its very first graduates, second graders, to last year’s graduates, kindergarteners. Follow-up data shows that 10 Books A Home graduates are scoring above grade level in all subjects except writing. 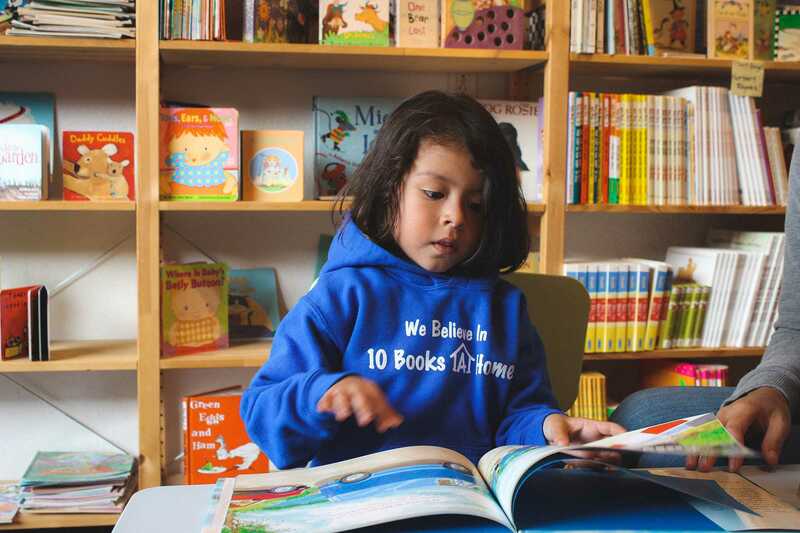 At the end of the day, 10 Books A Home is about cultivating a love of learning for all people, not just for preschoolers or low-income students.